Tradeshows. They’re one of the last vestiges of direct face-to-face contact with your market in an increasingly virtual world, yet some companies don’t fully understand how to do them successfully or even why they should make them a priority. As is the goal of most B2B companies, gaining the attention of the best prospects is always top priority. But how do you identify them and how do you get in front of them? The answer? Tradeshows. Including tradeshow and conference participation in your marketing plan greatly increases your business’ visibility to your target market. While standard marketing practices such as digital media, PR, editorial, advertising and even traditional sales help get the job done, tradeshow marketing is your chance to personalize the outreach by meeting the decision makers and other stakeholders who can assist in pulling it all together to get them to sign on the dotted line. First things first. What do you need? A plan, of course. Ask yourself the key questions. Who is your market? Where are they going? What are their interests? Which associations do they belong to? This will help narrow down which shows will give you maximum reach. Now that we have that step covered, let’s move on. Next up: What will help get my audience to my booth? Well, that’s where design, strategy and development come in. 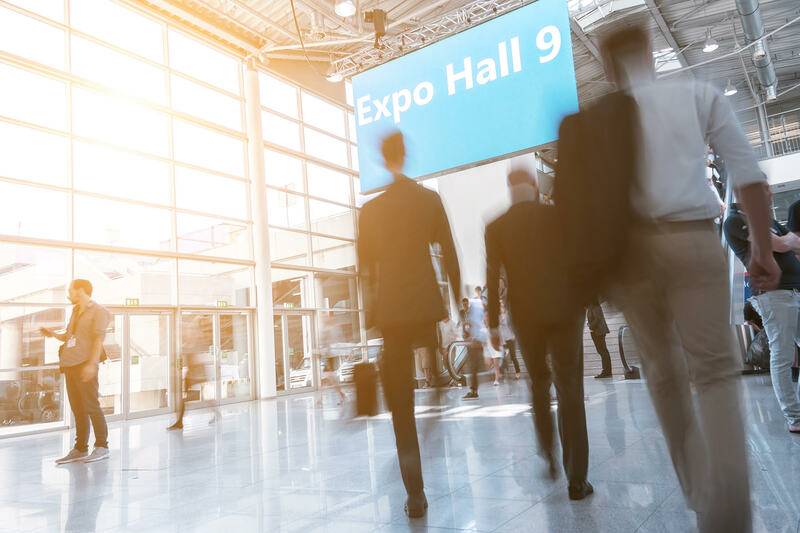 B2B-focused PR and marketing agencies can assist you in designing the optimal booth presence that will not only encourage attendees to stop and say hello, but will have them asking questions on what your product does and how it will benefit them. Strategizing a solid PR campaign before the show will also put your company at the top of everyone’s minds. Whether you’re launching a new product, adding an update or participating in an award at the show, PR pros can develop a solid plan to get you extensive media coverage that will have the tradeshow attendees putting you on their priority list of booths to visit. In addition to potential customers, most tradeshows are well attended by media representatives and editors who are looking for the latest industry news to share with their readers. Exhibiting at tradeshows and conferences can ensure that you are included in that important coverage. But why is all this important? Industry tradeshows are one of the most utilized marketing tools for B2B companies – and for good reason. Businesses that are looking for specific products and solutions tailored to their needs often look to industry-specific events to find the most innovative solutions that will benefit their company, while educating themselves on best practices. If you’re not in attendance at the biggest shows in your industry, odds are you’re missing out on some great leads and contacts that can lead to even greater sales. Also, remember that just because you decide not to attend, does not mean that your competition will opt to do the same, and the last thing you want to do is provide competing companies with a free pass to position themselves as the go-to industry leaders in your sector of the market. Obviously, this is just a quick overview of tradeshows and why you should include them as a line item in your marketing plan. But the number and variety of B2B shows in various markets can be staggering, not to mention expensive. Deciding which ones will provide the best ROI for your company and planning your strategy around them can be a much more complex process. For assistance, let us help you identify the best events for your company and create a strategic and cost-effective plan to get the most out of each one. Contact us today.